Irresistibly tasty. Vegetarian Society approved. Sustainable nutrition Quorn? 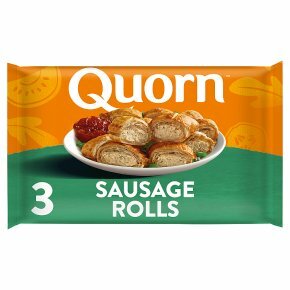 products contain Mycoprotein?, which is a nutritionally healthy source of protein because it's high in protein, high in fibre and low in saturated fat. Producing Mycoprotein? uses less land and water than animal protein production, so it's better for the planet too! Ready to eat. If you choose to cook, simply remove all packaging.12 minPreheat oven to 200ºC/Fan 180ºC/Gas 6.Place on a baking tray. Cook on the middle shelf. If cooking from frozen, cook for 20 minutes.All appliances vary, these are guidelines only.Check product is piping hot before serving.